I have talked about Evernote before, for those not familiar with it, check out my original post here. I love how I can add a note or pic for future reference no matter what device I am using or where I am. 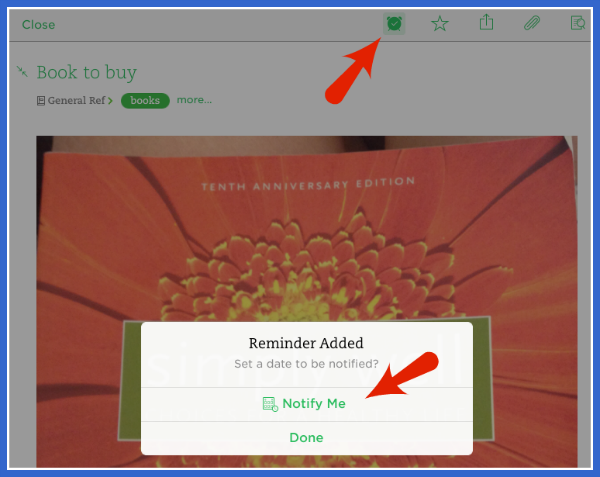 The reminders feature in Evernote is still fairly new. I didn't really look at using it until it became available on the Windows app in September this year. But now that it's here, there are some great uses that can help you stay on track in your business and life! I have a weekly checklist note set up for updates to my Facebook, blog and email newsletter to make sure they all get done. Now I have a reminder that pops up each Monday to make me start working on that checklist. When you save ideas about a project, put a reminder on it for your next project review date or on a day you know you'll be working on it. Speaking of projects, set a reminder to actually do a review each week. You can include the goals and milestones in the note with the reminder. Depending on how you use Evernote, the possibilities are endless. So don't let your important notes disappear into the cloud and be forgotten, use that little clock icon and be reminded to come back to those great ideas.